Our family celebrates spring with preparations for Easter Sunday Holiday and decorating of Easter Eggs. There are many ways to decorate eggs, such us coloring them with edible dyes in all different pastel colors, placing colorful stickers, beads, ribbons, etc. on eggs, drawing designs with markers, etc. 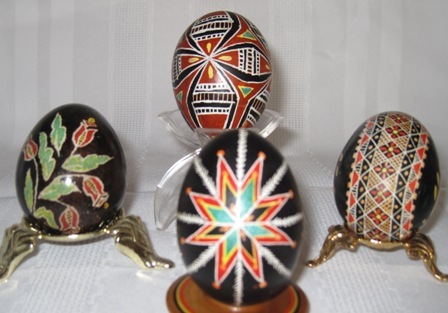 There is also a very intricate egg decorating style, which I will introduce you to, and that is the Ukrainian Easter Egg, Pysanka, design.